Product prices and availability are accurate as of 2019-02-22 17:47:41 EST and are subject to change. Any price and availability information displayed on http://www.amazon.com/ at the time of purchase will apply to the purchase of this product. This flushmounts exhibits the same beautiful detailing as a chandelier but in a smaller size suitable for lower ceilings and smaller spaces. Accommodates three 60-watt candelabra bulbs. 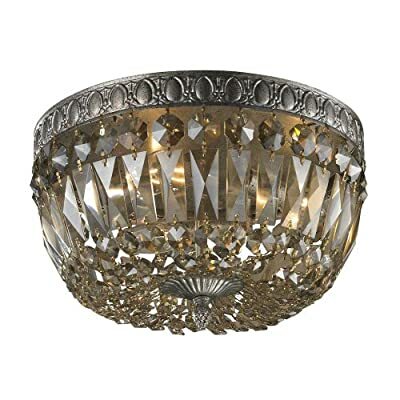 Perfect for lower ceilings in hallways, foyers and bedrooms. Available in sunset silver finish. Measures 12-inch width by 8-inch height.